"You want there to be a balance: always something green, often something orange or purple... I definitely don’t do the same menu every year." Who better to ask about feasting than a chef known for his affinity for elaborate jeweled rice dishes and 20-ingredient recipes (that are totally worth the effort)? If you've spent time perusing the cookbook section of your local bookstore throughout the last few years, you've probably seen the name Yotam Ottolenghi splashed across several crisp covers. The Israeli-British chef and restaurateur first captured our attention in 2008 with his self-titled collection of recipes, a collaboration with Palestinian chef and good friend Sami Tamimi, and has since become synonymous with elevated yet comforting recipes that fuze flavours from different cultures to create unique, palate-exploding dishes. 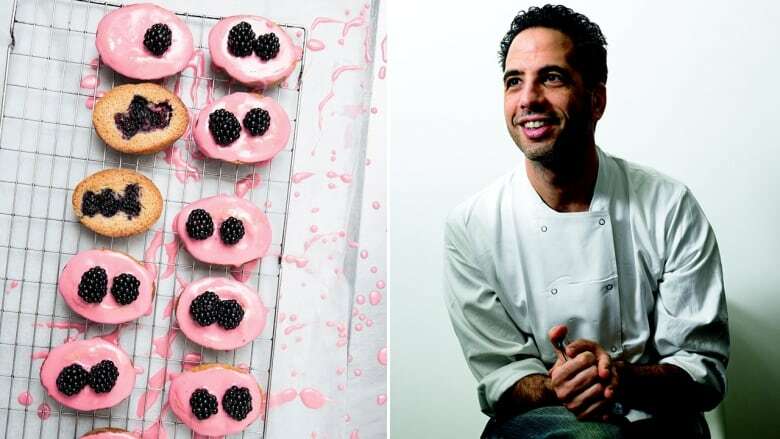 Ottolenghi also created a mini empire in the process, with five buzzy restaurants sprawled across London and six original cookbooks, the latest of which, a dessert-focused joint effort with pastry chef Helen Goh entitled Sweet, was released earlier this fall. All of this is why Ottolenghi was the first person we went to for advice for planning our holiday parties this year, from navigating meal prep (with friends and family stepping in as sous chefs!) to how to stay as calm in the kitchen as he does. First of all, when it comes to holiday feast planning, where do you start? A menu? Does it all come to you in a feverish dream? It sounds mad, but I sometimes start with the platters I want to serve things on. It can be the shape, or colour, or design of a platter that would look just perfect with an Asian-style baked fish, for example, or piled high with lentils and rice. From that central platter, the rest of the feast can follow. It's often a colour thing — you want there to be a balance: always something green, often something orange or purple and so forth. I definitely don't do the same menu every year. What's the best way to cook with a crowd in the kitchen? Are you a control freak in the kitchen? [My partner] Karl and I have a nice routine when we have friends coming over: one of us will head out with the kids for a couple of hours, doing the rounds from the bakery, to the grocers, to the wholefood shop and so on, and the other can blitz in the kitchen and get everything ready. If there is a crowd around, though, being the cook is actually the easy bit: everyone either wants to help (in which case there is always a herb to chop or lemon to zest) or else leaves you alone to focus on cooking. What are the one or two things you absolutely must make or eat over the holidays? I love to have panettone around to pick on and will also do a honey-roast ham to pick on between meals. I always tend to hone in on a good Asian noodle soup, as well: just what I want at this time of the year when there is so much food and drink the whole time. What's the #1 tip you have for hosts, to ensure a memorable and successful event? It's a cliché, but the only way to make an event memorable (for the right reasons) and successful is for the host to be relaxed and present. If the host is stressed and treating getting the food on the table as though it's a restaurant service then it [has an impact] on everyone. Work out what you need to do to be a relaxed host (prepare before, for example, so that you don't need to be cooking when everyone arrives) and then cook this way. And always make food that you want to eat and which you think is delicious. If it passes those two tests then you'll know you can't go too far wrong. And check out our rapid fire with the chef below. You can only eat one dessert for the rest of your life. What is it? Booze-soaked trifle. What's your personal version of 'engagement chicken'? Booze-soaked trifle. Or something comforting like gnocchi alla romana. Favourite word or expression right now? I say 'very delicious' a lot which is grammatically incorrect — delicious is an absolute which can't really be improved upon — but it makes complete sense to me! What keeps you awake at night? My son Max is going through a phase of thinking that playing Lego at the crack of dawn is a completely reasonable request. Your favourite late-night snack? A handful of nuts, a slice of tangy cheese. If you could be any age for a week, what would it be and why? I absolutely love hanging out with kids, so I guess it would be fun to see the world through the eyes of my kids for a week — 4 and 2 — to be reminded what it was like to be knee-height. What's your poison? Campari on ice if I want a spirit or, wine-wise, I'm pretty stuck on biodynamic wines. Wine which isn't just gives me a hangover these days. Your most unpopular/controversial food opinion? The constant presence of tinned smoked oysters in my cupboards does not appeal to everyone. You have an entire weekend to binge watch stuff — what's it gonna be? At the moment it's the latest season of Transparent. Secret Internet obsession? I'm pretty addicted to podcasts. I drive a lot so am always listening. You can only bring one kitchen tool to a desert island. What is it? My Japanese knifes. What's your secret for good health right now — activities or products? Pilates and green tea. What's the next big culinary trend that we need to know about before it hits? The move towards veganism. Pumpkin spice in baking. Yay or nay? Why not?! What's the one book you'd recommend to everyone? At the moment it's a first novel called Standard Deviation by Katherine Heiny. My goodness it made me laugh! What would your superpower be? Not getting tired. Your go-to ingredient/meal for when you want to detox? Raw-veg slaws, Asian noodles, chicken soup, green tea. What are you most proud of? Being married to Karl and having two sons. Best thing you ate in recent memory? A simple mezze dish or hot charred cherry tomatoes with cold lemony yoghurt.